Contributing to the transformation of the Sultanate of Oman’s public transport infrastructure, MAN Truck & Bus is currently delivering 33 state-of-the-art MAN Lion’s Coaches to Mwasalat, a government-owned public transport firm in the country. MAN Truck and Bus' official partner in Oman, Arabian Engineering Services LLC (AES) is managing the delivery process and will work closely with the national bus operator to ensure effective after-sales support for the coaches. Mwasalat is the first company in the region to add to its fleet MAN’s safest-ever Lion’s Coaches that are equipped with advanced technology to reduce accidents, improve passenger comfort and ensure efficient and safe driving. The advanced and emergency-braking MAN Lion’s Coaches, which use industry-leading accident prevention features, such as Emergency Brake Assist (EBA), Lane Guard System (LGS) as well as Adaptive Cruise Control (ACC), will replace the older Lion’s Coaches with more than 4,000,000 operated kilometer in the Mwasalat fleet of public transport vehicles. The Adaptive Cruise Control (ACC) and Emergency Brake Assist (EBA) systems use radar and onboard cameras to detect the speed and distance of other vehicles ahead of the MAN Lion’s Coach on the road. The vehicle automatically adjusts speed to ensure a safe distance is maintained at all times, and the Emergency Brake Assist will initiate braking if the driver fails to react to warnings of potential collisions. Likewise, the Lane Guard System (LGS) will warn drivers if they are drifting out of their lane. “With the delivery of our safest-ever Lion’s Coach, we have reiterated our commitment to supporting Mwasalat’s vision of encouraging the use of public transport to reduce congestion in the Sultanate’s roads by providing attractive, safe and environment-friendly mobility services. 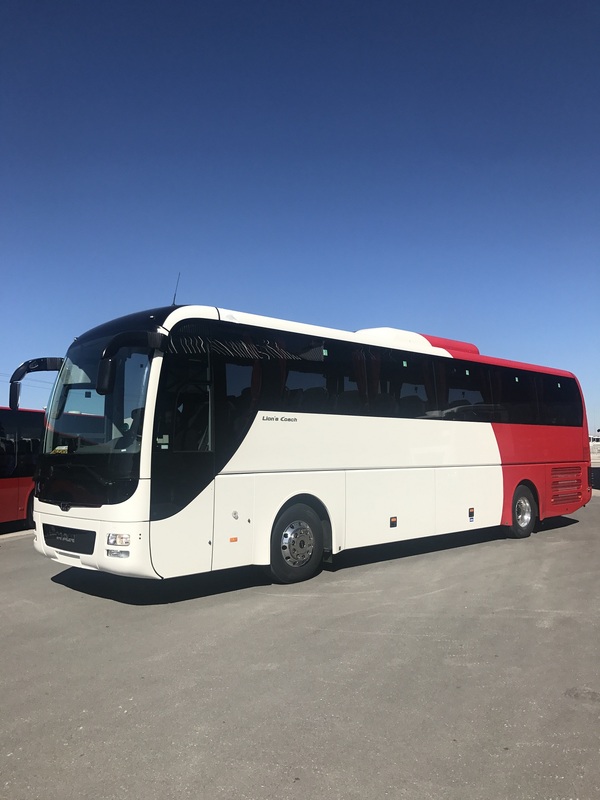 The best-in-class Lion’s Coach will drive greater value to the company as the vehicle provides excellent total cost of ownership. Moreover, the MAN Lion’s Coaches are equipped with efficient safety technologies that will complement the government’s efforts to improve road safety by bringing down the number of accidents involving heavy vehicles,” said Franz von Redwitz, Managing Director, MAN Truck & Bus Middle East. Commenting on the new milestone in their partnership with MAN Truck & Bus Middle East, Mohammed Saud Bahwan, Chairman, Arabian Engineering Services, said: “It is encouraging to witness the successful outcome of our collaboration with the region’s leading commercial vehicle manufacturer. Our services have always been aligned with the Sultanate’s vision of providing affordable, reliable and comfortable public transportation facilities for all nationals and residents in the country. An unprecedented achievement like this has reaffirmed our commitment”. In addition, Mwasalat also added 35 Lion’s City buses to its fleet to overhaul the country’s public transport infrastructure. Some of the state-of-the-art buses will be used on different routes in the capital city, while others will be used for airport services. The Lion’s City buses are already popular in several cities in the Middle East and around the world for their efficiency and economy. Owing to their high passenger capacity and low fuel consumption, the Lion’s City buses are well known for being cost-efficient.